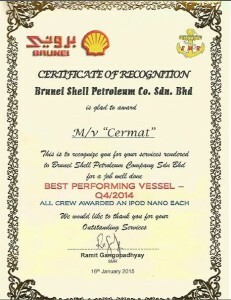 MEO CERMAT : We are pleased to announce that MV CERMAT has been chosen as Q4 2014 Best Performing Vessel by Brunei Shell Petroleum. 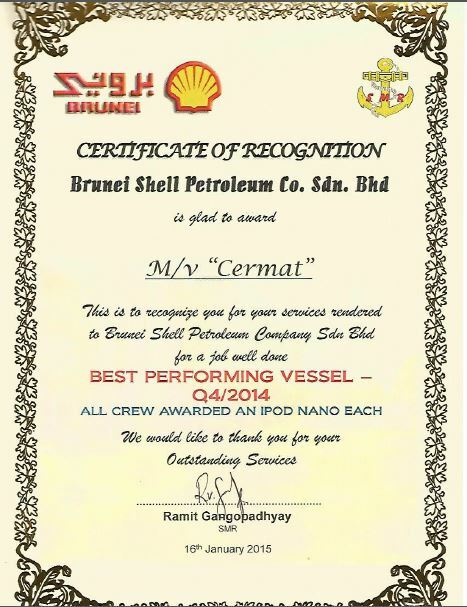 We congratulate the Master, Officers and Crew of MV CERMAT, who, by displaying high standards of safe work practice, operational excellence and customer service, have brought pride and joy to our Group. We also congratulate all the members of our team at the Brunei office who have guided and supported this achievement.